DETROIT US MAIL BOAT G.F. BECKER 1946 photo picture print for sale. 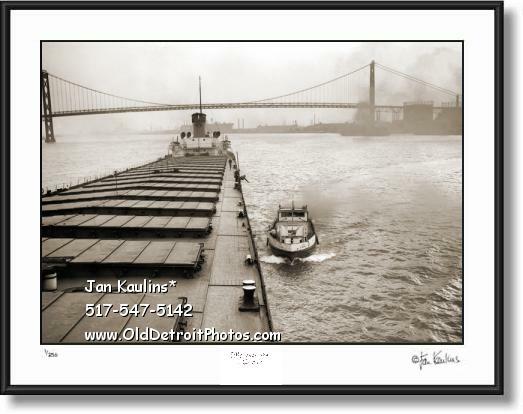 This sepia toned U.S. MAIL BOAT G. F. BECKER photo print is made from a restored historic vintage 1946 black and white Detroit Mailboat photograph. It is a fabulous image of the G. F. Becker pulling up along side of a large freighter to deliver and pick up the US Mail on the Detroit River. In the background we can the the large span of The Ambassador Bridge which spans the Detroit River between Canada and the USA. The Mail Boats are not owned by the USPS. Their services are obtained by government contract from private owners. The first Mail Boat began operation in 1895. The G.F.BECKER, shown in this historic rare Detroit photo, assumed the job and carried the US Mail from 1946 until 1948.